The longest living and most resilient tank of Poland’s Death Metal fleet has once again hoisted its flag – ready to overrun the world with its new triumphant procession. They recently fired their first warning shot with their ‘Iron Times’ EP, and now VADER are building their own all conquering empire with new studio album ‘The Empire’ (out 4th November). Pre-Order ‘The Empire’ Limited Edition lilac vinyl via the NBUK Store. Pre-Order ‘The Empire’ on CD. Pre-Order ‘The Empire’ on Vinyl. The lyric video of the track ‘Prayer to the God of War’ has been released via YouTube. The stunning cover artwork of ‘The Empire’ was created by acclaimed artist Joe Petagno who has also created artwork for Pink Floyd, Led Zeppelin, Motörhead, Marduk and Sodom. Without doubt, ‘The Empire’ falls under the category of VADER’s classic albums. The impressive monument that they have built with their 13th studio album will immediately find its place in metal history. And it will also prove that VADER don’t need to make their peace with the world; they never did, and they certainly don’t now – especially after writing more than 30 years’ worth of death metal history. The globally conquering weapon was produced, mixed and mastered by Wojtek and Slawek Wiesawski. ‘The Empire’ was completed within the secret bunkers of Hertz Studios in Bialystok, Poland. The weapon is going to be unleashed upon the world on November 4th, 2016 by commanders in chief, Nuclear Blast. 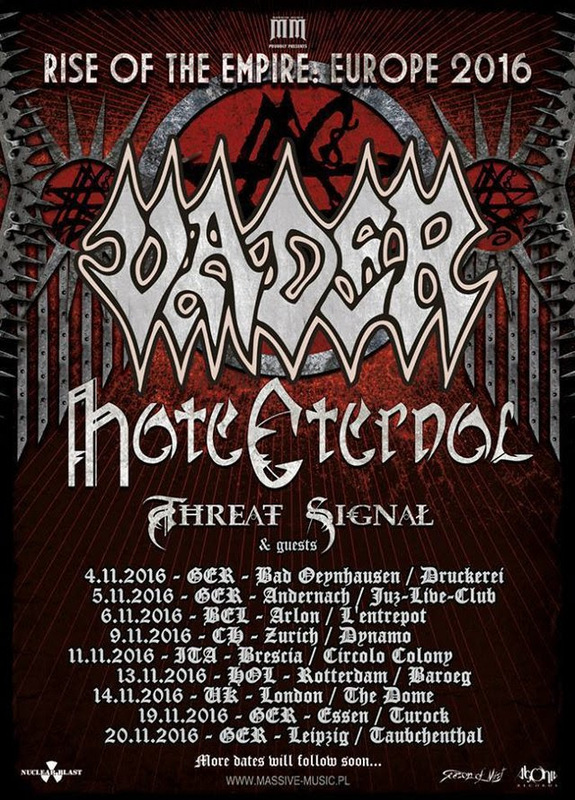 VADER will be returning to London this November, as part of their 9 date ‘Rise Of The Empire’European tour. They will be playing London venue, The Dome on 14th November alongside Florida death metal mob Hate Eternal and Canada’s syncopated metal machine Threat Signal. Vader recorded their first official material in 1989 in Olsztyn which became the 4-track demo‘Necrolust’. This was their first studio release that reached beyond the Polish borders and earned them some excellent reviews across the globe. They released the demo ‘Morbid Reich’ in 1990 which eventually gained the status of being one of the bestselling metal demos in history. ‘Morbid Reich’ was also the first release to host Vader’s now infamous logo.